This blue and white colored Magical Children Tent is an exotic place for those children who want to spend their time outdoors with immense adventure. It has one open front door and high raised cone shaped roof which make a perfect shelter under sun. 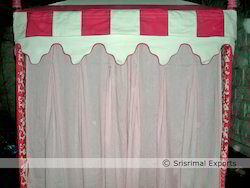 With the aid of efficient manufacturing team, our organization has been able to offer attractive Swiss Cottage Tents in various shapes and sizes. Our company is a very prominent name of the market for delivering a wide range of Kids Play Tent to our esteemed clients. These are broadly used in numerous sectors. Our products are made by using premium quality material and advance technology. These are procurable at a very economical market rates. Best for children play area, can be installed in garden, at roof or in room. Completely folding and easy to carry. They are Eco-friendly and water and fire resistant. Our team of skilled craftsmen uses traditional and elegant patchwork designs, braiding, tassels, mirror work, embroidery, wooden block printing and applique to provide an ornate touch. Matching with the requirements of our clients, we are into presenting a premium quality range of Baby Tent House to our precious clients. This Baby Tent House is widely used for outdoor and indoor play. Besides, these products are available with us in various designs and colors to choose from. 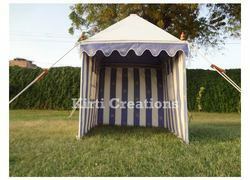 Owing to our proficiency in this domain, we are providing our clients an optimum range of Play Tent House. Lakshya Tent House provides Lights decoration in gurgaon, Lights decoration in delhi, Lights decoration in south city, Light decoration for wedding. We are a top notch supplier of Baby Tent House. We are engaged in manufacturing a wide range of play tent. We Deal In Kids Indoor Tent.